Even the words “production” and “design” are a bit confusing to me because, well, because those are two totally different departments, aren’t they? There is the production department and there is the design department or what we understand more directly as “concept design”, right? Everyone likes looking at the Concept Art, but that's just the beginning. Somebody's going to take that painting and interpret it and figure out how to get that into film. In the case of something like this in Avatar… (see image to right). We [know we] need to model those arches. We need to make a virtual set. But what does the rest of this environment look like? What are we doing in this environment? .... The [Production Designer] has to figure out how it functions in a story. Then it goes to modeling. It goes to set design, if we're talking about a more practical set, then interior and architecture. Then there's the fabrication, if we're talking traditional. Then it becomes a job site, then you're the Foreman of a job site. That's where you deal with the Art Direction, you're supervising Art Directors. There's so much beyond that. From Concept Art to film is a GIGANTIC PROCESS. [Production Designers] often the unsung heroes, because you just don't hear about it as much, but the polish of the design and going through all the little minutiae. Doing the accurate models, the accurate plans, finishes and lighting and all that stuff is just a massive, massive deal. While the painting is a ton of fun, it's just one tiny part of the job. It started to sound more like management, to me, and less like painting so I had to ask him how painting fit into the equation. After all, Dylan Cole is known for his amazing paintings. His answer really set the bar for me because many of us are only looking at the FIRST hurdle we have, as artists, which is to create a picture that get approved, right? But what do you do after that? Once you make a picture that gets approved and you can do that over and over well... you have a job, right? But what's next, where does it all go? Imagine 10 years from now. You've been creating images that get approval for ten years... what's next for you? That frustration we feel sometimes when we are not creating? That's the frustration of an animal that's been kept locked up too long. Yes, I called you an animal... That frustration is our pent up energy just begging us to go to off on the next adventure because Vision is always looking for the next step. 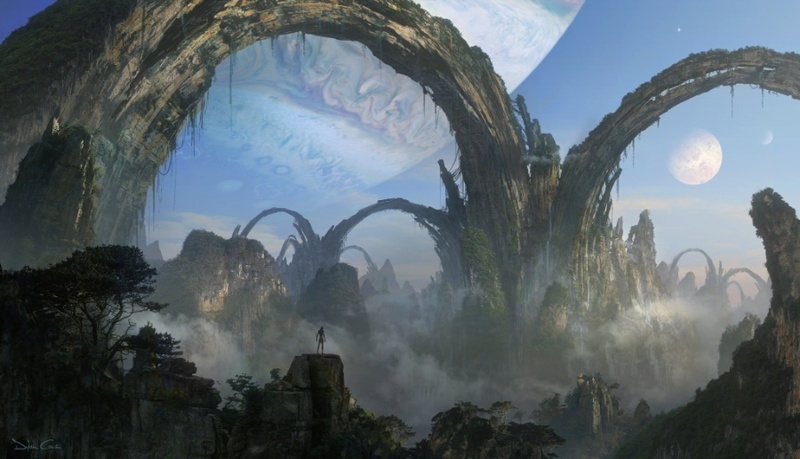 It's just the nature of Vision to always be looking to the horizon, to that next journey but it's the job of the Production Designer to shepard that Vision into reality. The painting starts it. Oh yeah, absolutely. The painting is what gets approved and leads the charge. I'm not saying it's not important, it's massively important, but it's also about continuing to do your best to maintain what you love about the painting or the illustration or the 3d model. Whatever the initial idea is. It's about maintaining that through the whole process, again, and that's where a lot of the challenge is. I've always said the hardest thing about painting, for me, is maintaining the spirit of a sketch in a final illustration. ... You'll have the energy of a brush stroke, which can only exist in a sketch, right? If you're doing a finished illustration, the brush strokes aren't there. Obviously in the final frame of a film, they're certainly not there. It's about, okay, how do you evoke that? What did you like about that brush stroke? What does that brush stroke imply? How can you create the same energy in different ways and all that stuff? It's hard, for example on a piece like this (see image to right), it's very detailed, but you might take some energy from the ship that's in the sky. You're trying to create movement and energy in there. Obviously, this a very somber piece but you still and try to imply things going on. It's actually quite hard and stuff gets very stiff, very quickly, once you start doing more refined tuned models or photo bashing and that's actually really, really hard. I still maintain it's the hardest thing for me is to maintain that energy. Tell me what you think but what I understood was that the Production Designer bridges the world of concept and production. They have a foot in both worlds. They live in the design world but they speak the language of production. They are, in fact, that next step for an artist looking to build their own vision. If you chart the path of Dylan's friend Robert Stromberg, Academy Award winner for Best Production Design, it leads right into the Director's chair.